We believe that new technologies bring new ways to access culture – they are not a threat for creators. We believe that the legitimacy crisis of the current EU copyright regime is created by the system itself. We believe there’s a need for a modernised copyright regime which takes into consideration the needs of all parts of society, including creators. 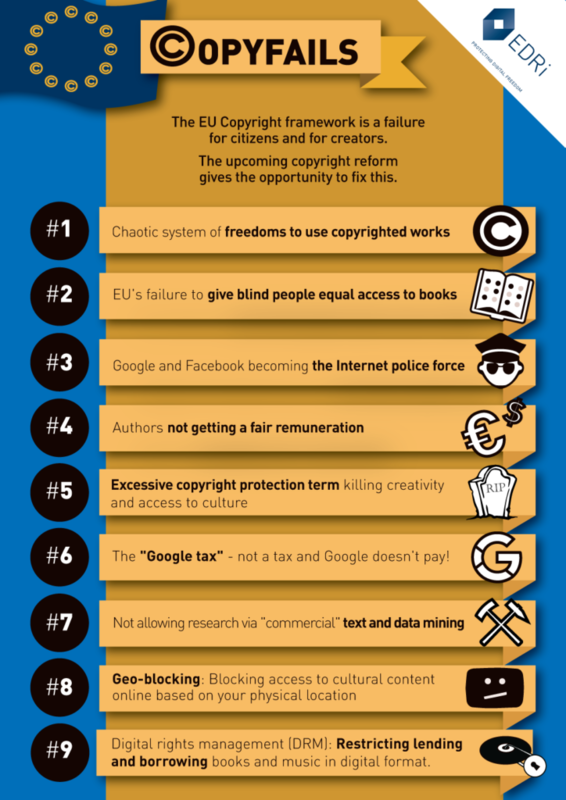 Europe needs a more profound reform of the EU copyright regime than the one that the European Commission has announced. To illustrate this, we have identified nine copyfails – crucial failures of the current EU system. You can read all the blogposts of our “copyfails” in the list below. The European Commission has set in its agenda reforming copyright as one of the foundations to build the Digital Single Market. However, the Communication published at the end of 2015 did not meet the expectations of the announced “more modern, more European” copyright. On the contrary, the Commission apparently only wants to paper over the serious cracks in the wobbling structure of EU copyright legislation rather than addressing the real problems. Are you ready to #fixcopyright in the EU? Follow #fixcopyright on Twitter!